to Pamela Soap, the gentle and fresh handmade natural soap created from pure, aromatherapy grade essential oils, the finest saponified vegetable oils, and organic botanicals. Our passion is to supply our customers with unique and natural soap at the peak of freshness and bloom. “Use fresh when it’s the best.” As experienced soapmakers, we know that a bar of truly natural soap has a definite freshness peak. This is the wonderful, perfectly balanced prime time of the soap’s life when fragrance, lather, emollience, moisturizing power, and aromatherapy benefits are all at their maximum. That is why we make every bar from small batches in a traditional cold process method to assure you freshness and quality. 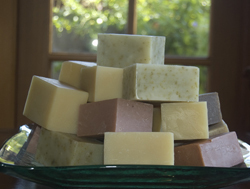 Our use of the finest olive, coconut, and palm oils forms the basis of our soap. We blend only natural essential oils for their aromatherapy and skin healing benefits and shea butter for richness, resulting in the unique synergistic alchemy found in this very special soap. These are the Pamela Soap differences. We are sure you will agree and be very pleased the first time you try it.